For many children, sleep is an obstacle. Kids of all ages resist sleep, often because they think they have more exciting things to do than rest. At a young age, children don’t want to slow down and sleep, preferring exploring and learning. Teens may have so many commitments, assignments, and social engagements that they don’t feel they have enough time for it all — taking time away from sleep. Although kids often put sleep at a low priority level, it’s important for parents to encourage healthy sleep habits. 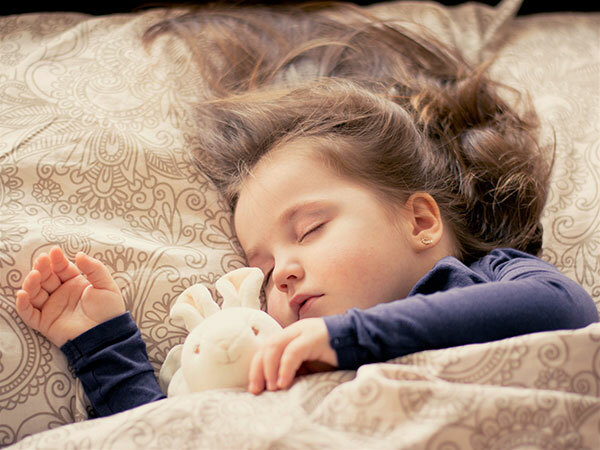 Children and teens need sleep to learn and grow healthy, and establishing healthy sleep habits in childhood can help your kids maintain good sleep for a lifetime. — and it supports healthy growth as well. When kids sleep, their bodies work on growing, restoring, and mental processing. Human growth hormone, which supports growth and regeneration, is released late at night and is best supported by deep sleep. New ideas and information are processed into memories during sleep, helping kids retain what they’ve learned each day. When kids get enough sleep, they’re more alert and able to face the challenges of the day. They can better retain and organize new information learned throughout the day, and they are more emotionally and physically prepared to bounce back from stress. When kids don’t get enough sleep, everything is more difficult. Children may experience difficulty with alertness, learning, and memory, which can be particularly detrimental at school. They may struggle emotionally, resulting in tantrums and outbursts from feeling too tired to deal well with frustrations throughout the day. Teens, in particular, are in a danger spot for sleep deprivation. Their circadian rhythms shift in puberty, pushing bedtimes back — but they still have to wake up on time for school. Most U.S. middle schools and high schools start the school day before 8:30 a.m. This often leaves teens without enough rest, building up a sleep debt every night. Teens who don’t sleep well may experience moodiness and are more likely to face poor grades, obesity, and the dangers of drowsy driving. Especially dangerous is the increased risk of anxiety, depression, and suicide associated with sleep deprivation in teens. Teens who are sleep deprived are more likely to engage in unhealthy risk behaviors, such as drinking, smoking, and using drugs. Make sleep a priority. It’s easy to let a busy schedule chip away at sleep time, but it’s important that you make sleep a priority. Determine how much time your child needs to sleep at night, and plan your schedule from there. You may need to prioritize sleep over other activities. Create a healthy sleep environment. Give kids a good place to sleep. Make sure their bedroom is clean, comfortable, cool, dark, and quiet. This can support healthy sleep, making their sleep environment relaxing and inviting. Encourage healthy sleep habits. Teach kids good sleep habits at an early age. Encourage them to maintain a regular sleep schedule and bedtime routine. Help them avoid sleep pitfalls that can interfere with good sleep, such as consuming caffeine or heavy meals late at night, or using screens just before bed.